ROCHESTER, N.Y. -- Nearly one in five older patients with advanced cancer have financial problems that may cause them to delay treatment to cover food and housing costs, which leads to stress and poor quality of life, according to new Wilmot Cancer Institute research. 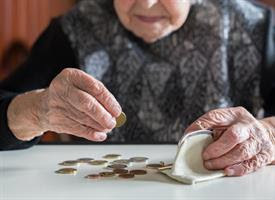 The “financial toxicity” study was conducted at several cancer clinics across the country, involving 542 patients ages 70 to 96, said senior author Supriya Mohile, M.D., M.S., a geriatric oncology expert and the Philip and Marilyn Wehrheim Professor at Wilmot. Asad Arastu, M.Sc., a University of Rochester School of Medicine and Dentistry student with a background in economics, led the research by slicing out a subset of data from a larger, peer-reviewed study on geriatric assessments that Mohile had conducted in the past. They developed an easy-to-use screening tool for patients comprised of three questions: Have you ever delayed medications due to cost? Have you ever had insufficient income in a typical month for food and housing? Have you ever had insufficient income in a typical month for other basic needs? Patients who answered yes to any of the questions were categorized as experiencing financial toxicity, Arastu said. The goal was to create a screening tool for busy oncologists with content that patients could easily and quickly understand. On average, patients with financial hardships also scored lower on measurements of anxiety, depression, and quality of life — important factors to consider when caring for these patients because they can impact outcomes, Mohile said. Additionally, the researchers discovered that when patients met the criteria for financial toxicity, oncologists only discussed cost issues with them about 50 percent of the time. The American Society of Oncology (ASCO) is highlighting the abstract at its annual Quality Care Symposium on Sept. 28 and 29. The research has not yet been published by a peer-reviewed journal. The next step is to develop standards for helping older cancer patients solve financial difficulties. A lot of variability exists in clinics across the U.S., requiring the sharing of best practices, Mohile said. The national Patient-Centered Outcomes Research Institute (PCORI) funded the research. In May, ASCO honored Mohile with the 2018 B.J. Kennedy Award for Scientific Excellence in Geriatric Oncology.